CALGARY, Feb. 5, 2014 /CNW/ – (ARX – TSX) ARC Resources Ltd. (“ARC”) released today its 2013 year-end reserves and resources information. “I am really pleased with our team’s performance again this year. We added significant reserves at a low finding cost through the drill bit and continued to convert our large reserve and resource base into production and cash flow,” stated Myron Stadnyk, President and CEO. Replaced approximately 200 per cent of 2013 total production, adding 68.4 mmboe of proved plus probable (“2P”) reserves. 2P reserves increased four per cent to 634 mmboe, comprised of 2.6 Tcf of natural gas and 194 mmbbls of crude oil and natural gas liquids (“NGL’s”) at year-end 2013. Replaced 180 per cent of 2013 crude oil and NGL’s production, adding 25 mmbbls of 2P crude oil and NGL’s reserves. ARC’s crude oil and liquids development resulted in a four per cent increase in 2P crude oil and NGL’s reserves from 186 mmbbls to 194 mmbbls. Finding and Development costs (“F&D”) of $12.79 per boe for 2P reserves and $17.45 per boe for proved reserves excluding changes in Future Development Capital (“FDC”). ARC’s three year average F&D costs for 2P reserves were $8.24 per boe, excluding changes in FDC. ARC’s 2013 capital development program focused significantly on oil and liquids development which typically carries higher finding and development costs, while yielding higher returns given the current commodity price environment. ARC’s 2P RLI has decreased to 15.5 years from 17.5 years and the Future Development Cost to develop our reserves has declined to $3.3 billion from $3.4 billion at year-end 2012. Both are the result of significant capital being spent in 2013, which is expected to increase production to a range of approximately 110,000 to 114,000 boe per day in 2014. The reduction in FDC is also partially attributable to capital efficiencies recognized through pad drilling and longer horizontal wells. Including changes in FDC, ARC’s 2P F&D was $11.47 for 2013 and $12.01 for the trailing three year average. Proved F&D including changes in FDC, was $18.11 for 2013 and averaged $17.42 for the three year average. Recycle ratio of 2.2 times and 3.3 times for the current year and three year average, respectively, for 2P reserves based on current and three year average F&D costs, before changes in FDC, and based on 2013 and three year average netbacks of $28.57 per boe and $27.24 per boe, respectively. ARC updated an Independent Resources Evaluation (“Resources Evaluation” or “Independent Resources Evaluation”) for its Montney lands in the northeast British Columbia (“NE B.C.”) Montney region. The updated evaluation reaffirmed the significant resource base on ARC’s NE B.C. Montney lands of 55.1 Tcf of natural gas resource (10 per cent increase relative to 50.1 Tcf in 2012) and 2.2 billion barrels of oil resource (50 per cent increase relative to the 1.5 billion barrels in 2012). GLJ conducted an independent reserves evaluation effective December 31, 2013 and prepared in accordance with definitions, standards and procedures contained in the Canadian Oil and Gas Evaluation Handbook (“COGE Handbook”) and NI 51-101. The reserves evaluation was based on GLJ forecast pricing and foreign exchange rates at January 1, 2014 as outlined in Table 1 below. Reserves included herein are stated on a company gross basis (working interest before deduction of royalties without including any royalty interests) unless noted otherwise. All reserves information has been prepared in accordance with National Instrument (“NI”) 51-101. This news release contains several cautionary statements that are specifically required by NI 51-101 under the heading “Information Regarding Disclosure on Oil and Gas Reserves, Resources and Operational Information”. In addition to the detailed information disclosed in this news release more detailed information will be included in ARC’s Annual Information Form (“AIF”). (1) Reserves additions for Infill Drilling, Improved Recovery and Extensions are combined and reported as “Extensions and Improved Recovery”. ARC’s 2P RLI was 15.5 years at year-end 2013 while the proved RLI was 9.1 years based upon the GLJ reserves and ARC’s 2014 production guidance mid-point of 112,000 boe per day. The increase in the 2P RLI from 2009 through 2012 was attributed to the successful development of the Montney region and the resultant growth in 2P reserves. Along with the 2P reserves growth, ARC’s annual average production increased from 63,538 boe per day in 2009 to 96,087 boe per day in 2013. ARC expects significant year-over-year production growth based on estimated 2014 production of 110,000 to 114,000 boe per day. The decrease in the RLI at year-end 2013 is due to the expected increase in 2014 production, resulting from the development capital spent in 2013 to bring on new production at Parkland, Tower and Sunrise. The following table summarizes ARC’s historical RLI. (1) Based on 2014 production guidance midpoint of 112,000 boe per day. ARC’s crude oil, natural gas and natural gas liquids reserves were evaluated using GLJ’s commodity price forecasts effective January 1, 2014. The NPV is prior to provision for interest, debt service charges and general and administrative expenses. It should not be assumed that the NPV of Cash Flow estimated by GLJ represents the fair market value of the reserves. NPVs on both a before and after tax basis are presented below. (1) Based on NI-51-101 Net Interest reserves and GLJ January 1, 2014 Forecast Prices and Costs. (2) Based on ARC’s estimated tax pools at year-end 2013. (3) The after-tax net present value of ARC’s oil and gas properties here reflects the tax burden on the properties on a stand-alone basis. It does not consider the business-entity-level tax situation, or tax planning. It does not provide an estimate of the value at the level of the business entity, which may be significantly different. ARC’s Audited Consolidated Financial Statements and Management’s Discussion & Analysis should be consulted for information at the business entity level. At a 10 per cent discount factor, and on a before tax basis, proved producing reserves constitute 52 per cent of the 2P estimated value while total proved reserves account for 68 per cent of the 2P estimated value. NI 51-101 requires that F&D costs be calculated including changes in FDC. Changes in forecast FDC occur annually as a result of development activities, acquisition and disposition activities and capital cost estimates that reflect the independent evaluator’s best estimate of what it will cost to bring the proved undeveloped and probable reserves on production. Future development capital declined slightly to $3.3 billion at year-end 2013 relative to $3.4 billion at year end 2012. The increase in FDC from reserve-adding capital in 2013 was offset by lower well costs in certain fields resulting from capital efficiencies gained with the application of multi-well pad development, and a decrease in future drilling locations in certain fields. The decrease in future drilling locations was the result of changes to the development plans for certain fields whereby longer horizontal laterals are planned, resulting in larger reserves per well and requiring fewer wells to access the reserves. Following is a summary of GLJ estimated FDC required to bring total proved and probable reserves on production. (1) FDC as per GLJ independent reserve evaluation as of December 31, 2013 and based on GLJ forecast pricing as at January 1, 2014. ARC’s F&D costs were $12.79 per boe and $17.45 per boe for 2P and proved reserves, respectively in 2013, before changes in FDC ($11.47 per boe and $18.11 per boe, respectively, for 2P and proved reserves, including changes in FDC). ARC’s three year average F&D costs were $8.24 per boe for 2P reserves and $14.18 per boe for proved reserves, before changes in FDC. The low F&D costs are attributed to the high quality of ARC’s property portfolio, excellent results from ARC’s development program and strong reserve growth particularly at Sunrise, Septimus, Dawson, Parkland, Tower, Ante Creek, and Pembina. Including net acquisitions, ARC’s 2013 FD&A costs were $13.32 per boe of 2P reserves and $18.31 per boe of proved reserves, before changes in FDC ($12.07 per boe and $19.18 per boe, respectively, for 2P and proved reserves, including changes in FDC). The three year average FD&A costs were $8.39 per boe for 2P reserves and $15.00 per boe for proved reserves, before changes in FDC. ARC’s low FD&A costs reflect ARC’s focus on high quality assets, cost management and allocation of resources and capital to the highest rate of return projects. The following table illustrates FD&A costs excluding and including changes in FDC. (1) The aggregate of Exploration and Development (“E&D”) costs incurred in the most recent financial year and the change during that year in estimated future development costs (“FDC”) generally will not reflect total finding and development costs related to reserves additions for that year. (2) Under NI 51-101, the calculation of F&D costs must incorporate the change in future development capital required to bring the proved undeveloped and probable reserves to production. In all cases, the F&D, or FD&A number is calculated by dividing the identified capital expenditures by the applicable reserves additions both before and after changes in FDC costs. The following discussion in “NE B.C. Montney Resources Evaluation” is subject to a number of cautionary statements, assumptions and risks as set forth therein. See “Information Regarding Disclosure on Oil and Gas Reserves, Resources and Operational Information” at the end of this release for additional cautionary language, explanations and discussion and “Forward Looking Statements” for a statement of principal assumptions and risks that may apply. See also “Definitions of Oil and Gas Resources and Reserves” in this news release. The discussion includes reference to TPIIP, DPIIP and ECR as per the GLJ Petroleum Consultants Ltd. (“GLJ”) Resources Evaluation as at December 31, 2013, prepared in accordance with the Canadian Oil and Gas Evaluation Handbook (“COGE Handbook”). Unless indicated otherwise in this news release, all references to ECR volumes are Best Estimate ECR volumes. The Montney formation in NE B.C. has been identified as a world class unconventional natural gas resource play with the potential for significant volumes of recoverable resources. The area includes dry gas, liquids-rich gas and crude oil development opportunities. It is one of the largest and lowest cost natural gas resource plays in North America. ARC has a significant presence in the region with a land position of 527 net sections, located primarily in the most prospective areas of the play. GLJ was commissioned to conduct an Independent Resources Evaluation for ARC’s lands in the NE B.C. Montney region including Dawson, Parkland, Tower, Red Creek, Sunrise/Sunset, Attachie, Septimus, Sundown, and Blueberry in northeastern B.C and Pouce Coupe just across the border in Alberta (the “Evaluated Areas”). The Resources Evaluation was effective December 31, 2013 based on GLJ forecast pricing as at January 1, 2014. All references in the following discussion to ECR, TPIIP and DPIIP are in reference to the Evaluated Areas included in the Independent Resources Evaluation. See “Definitions of Oil and Gas Resources and Reserves” in this news release. The evaluation reaffirmed that the NE B.C. Montney region provides a significant long-term growth opportunity with considerable potential reserves, extending well beyond existing booked reserves and even the current estimates of the Economic Contingent Resource (“ECR”). ARC’s NE B.C. Montney assets provide optionality for future growth through commodity price cycles given the diversity of ARC’s Montney landholdings with exposure to liquids-rich natural gas, crude oil and dry natural gas. We believe there is considerable upside in our NE B.C. Montney assets given our significant resource base. ARC’s 2013 capital development program was focused on crude oil and liquids rich-gas opportunities throughout ARC’s entire asset portfolio while maintaining gas production. In NE B.C., ARC’s capital development program consisted of drilling 41 gross operated (40.5 net) wells comprised 13 oil wells at Tower, 15 liquids-rich wells at Parkland and 13 gas wells (nine wells at Dawson, two wells at Sunrise, one well at Attachie and one well at Blueberry). TPIIP for the gas bearing lands in the evaluated areas increased 10 per cent relative to 2012 to 55.1 Tcf. The 2013 drilling program resulted in a 12 per cent increase of DPIIP for the evaluated areas to 30.4 Tcf. Growth in gas TPIIP and DPIIP is primarily attributed to 2013 land acquisition activity in Attachie, Blueberry and Pouce Coupe. NGL 2P reserves associated with the natural gas resource increased 10 per cent from 24.7 mmbbls in the 2012 evaluation to 27.2 mmbbls. NGL’s ECR increased five percent from 111.2 mmbbls to 116.5 mmbbls and NGL’s prospective resource increased slightly from 113.6 mmbbls to 114.1 mmbbls in 2013, due to increased land holdings. On the oil bearing lands at Tower, Red Creek and Attachie East, GLJ identified 2,189 mmbbls of TPIIP and 1,714 mmbbls of DPIIP as well as 10.7 mmbbls of ECR and 11.2 mmbbls of 2P reserves. The increase in oil TPIIP and DPIIP is attributed to land acquisition activity at Red Creek. The Tower field is still in the early stages of development and Red Creek is in the exploration stage, therefore additional production data is required to better understand the recoverable potential of these fields. However, with continual advancements in drilling and completion technology, early indications are very favorable for exploitation of this significant oil resource. The following tables summarize the results of the 2013 and 2012 resources evaluations. (1) TPIIP, DPIIP and UPIIP have been estimated using a zero percent porosity cut-off which means that all gas bearing rock has been incorporated into the calculations. Using a three per cent porosity cut-off, the 2013 TPIIP, DPIIP and UPIIP estimates would be 42.9 Tcf, 25.2 Tcf, and 17.7 Tcf, respectively. (2) The Resource Categories in this table do not include the free oil/liquids. (3) All volumes in table are company gross and raw gas volumes. (4) TPIIP includes 0.9 Tcf and DPIIP include 0.8 Tcf of solution gas associated with Tower oil and Red Creek oil. (1) TPIIP, DPIIP and UPIIP have been estimated using a three percent porosity cut-off for oil due to lower mobility for oil relative to gas. Using a six per cent porosity cut-off, the 2013 TPIIP, DPIIP and UPIIP estimates would be 924 mmbls, 742 mmbbls and 182 mmbbls. (2) All volumes in table are company gross. (1) All DPIIP other than cumulative production, reserves, and ECR has been categorized as unrecoverable. Cumulative Raw production to year end 2013 was 0.4 Tcf of gas, 0.5 mmbbls of oil and 4.0 mmbbls of NGLs, which are all immaterial in relation to the Reserves and ECR magnitude. (NGL cumulative production is calculated based on current NGL recoveries). (2) All volumes in table are company gross and sales volumes. (3) For reserves, the volume under the heading Best Estimate are 2P reserves. (4) The liquid yields are based on average yield over the producing life of the property. (1) All UPIIP other than Prospective Resources has been categorized as unrecoverable. GLJ estimated DPIIP values using a porosity cut-off of three per cent for natural gas and six per cent for oil. Based upon the forgoing analysis and ARC’s expertise in the Montney formation in NE B.C., it is expected that significant additional reserves will be developed in the future with continued drilling success on currently undeveloped Montney acreage together with further development, completion refinements and improved economic conditions. Historic drilling success and recoveries on the more fully developed Montney acreage, abundant well log and production test data, and the application of increased drilling densities support ARC’s belief that significant additional resources will be recovered. Continuous development through multi-year exploration and development programs and significant levels of future capital expenditures are required in order for additional resources to be recovered in the future. The principal risks that would inhibit the recovery of additional reserves relate to the potential for variations in the quality of the Montney formation where minimal well data currently exists, access to the capital which would be required to develop the resources, low commodity prices that would curtail the economics of development and the future performance of wells, regulatory approvals, access to the required services at the appropriate cost, and the effectiveness of fraccing technology and applications. The primary contingencies that prevent the economic contingent resources from being classified as reserves are the requirement for additional drilling, completion and testing data to confirm commercial production rates for development not immediately offsetting existing production. Confirmation of commercial productivity is generally required before the company can prepare firm development plans and commit required capital for the development of the ECR. Additional contingencies are related to the current lack of infrastructure required to develop the resources in a relatively quick time frame. As continued delineation occurs, some resources currently classified as ECR are expected to be re-classified to Reserves. Total Petroleum Initially-In-Place (“TPIIP”) is that quantity of petroleum that is estimated to exist originally in naturally occurring accumulations. It includes that quantity of petroleum that is estimated, as of a given date, to be contained in known accumulations, prior to production, plus those estimated quantities in accumulations yet to be discovered. Discovered Petroleum Initially-In–Place (“DPIIP”) is that quantity of petroleum that is estimated, as of a given date, to be contained in known accumulations prior to production. The recoverable portion of discovered petroleum initially in place includes production, reserves, and contingent resources; the remainder is unrecoverable. Economic Contingent Resources (“ECR”) are those contingent resources which are currently economically recoverable. Uncertainty Ranges are described by the Canadian Oil and Gas Evaluation Handbook as low, best, and high estimates for reserves and resources. The Best Estimate is considered to be the best estimate of the quantity that will actually be recovered. It is equally likely that the actual remaining quantities recovered will be greater or less than the best estimate. If probabilistic methods are used, there should be at least a 50 percent probability (P50) that the quantities actually recovered will equal or exceed the best estimate. All amounts in this news release are stated in Canadian dollars unless otherwise specified. Where applicable, natural gas has been converted to barrels of oil equivalent (“BOE”) based on 6 Mcf:1 BOE. The BOE rate is based on an energy equivalent conversion method primarily applicable at the burner tip, and given that the value ratio based on the current price of crude oil as compared to natural gas is significantly different than the energy equivalency of the 6:1 conversion ratio, utilizing the 6:1 conversion ratio may be misleading as an indication of value. The BOE rate is based on an energy equivalent conversion method primarily applicable at the burner tip and does not represent a value equivalent at the wellhead. Use of BOE in isolation may be misleading. In accordance with Canadian practice, production volumes and revenues are reported on a company gross basis, before deduction of Crown and other royalties, unless otherwise stated. Unless otherwise specified, all reserves volumes in this news release (and all information derived therefrom) are based on “company gross reserves” using forecast prices and costs. Our oil and gas reserves statement for the year-ended December 31, 2013, which will include complete disclosure of our oil and gas reserves and other oil and gas information in accordance with NI 51-101, will be contained within our Annual Information Form which will be available on our SEDAR profile at www.sedar.com. This news release contains references to estimates of oil and gas classified as TPIIP, DPIIP, UPIIP and ECR in the Montney region in northeastern British Columbia which are not, and should not be confused with, oil and gas reserves. See “Definitions of Oil and Gas Resources and Reserves”. Projects have not been defined to develop the resources in the Evaluated Areas as at the evaluation date. Such projects, in the case of the Montney resource development, have historically been developed sequentially over a number of drilling seasons and are subject to annual budget constraints, ARC’s policy of orderly development on a staged basis, the timing of the growth of third party infrastructure, the short and long-term view of ARC on gas prices, the results of exploration and development activities of ARC and others in the area and possible infrastructure capacity constraints. ARC’s belief that it will establish significant additional reserves over time with conversion of DPIIP into ECR, ECR into 2P reserves and probable reserves into proved reserves is a forward looking statement and is based on certain assumptions and is subject to certain risks, as discussed below under the heading “Forward Looking Information and Statements”. The oil and natural gas reserves contained in this press release have generally been prepared in accordance with Canadian disclosure standards, which are not comparable in all respects of United States or other foreign disclosure standards. For example, the United States Securities and Exchange Commission (the “SEC”) generally permits oil and gas issuers, in their filings with the SEC, to disclose only proved reserves (as defined in SEC rules). Canadian securities laws require oil and gas issuers, in their filings with Canadian securities regulators, to disclose not only proved reserves (which are defined differently from the SEC rules) but also probable reserves, each as defined in NI 51-101. Accordingly, proved reserves disclosed in this news release may not be comparable to U.S. standards, and in this news release, ARC has disclosed reserves designated as “probable reserves” and “proved plus probable reserves”. Probable reserves are higher risk and are generally believed to be less likely to be accurately estimated or recovered than proved reserves. The SEC’s guidelines strictly prohibit reserves in these categories from being included in filings with the SEC that are required to be prepared in accordance with U.S. disclosure requirements. 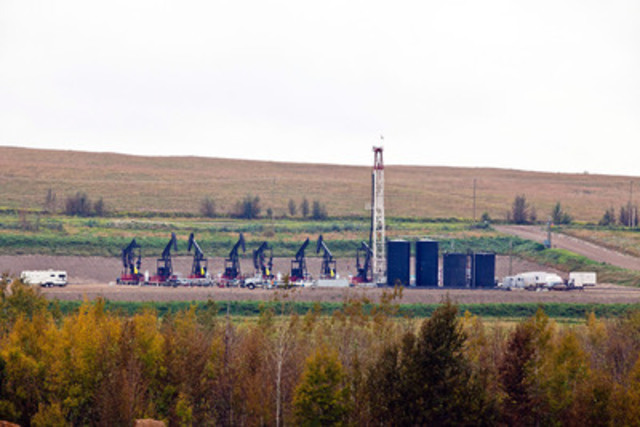 In addition, under Canadian disclosure requirements and industry practice, reserves and production are reported using gross volumes, which are volumes prior to deduction of royalty and similar payments. The practice in the United States is to report reserves and production using net volumes, after deduction of applicable royalties and similar payments. Moreover, ARC has determined and disclosed estimated future net revenue from its reserves using forecast prices and costs, whereas the SEC generally requires that prices and costs be held constant at levels in effect at the date of the reserve report. As a consequence of the foregoing, ARC’s reserve estimates and production volumes in this news release may not be comparable to those made by companies utilizing United States reporting and disclosure standards. Additionally, the SEC prohibits disclosure of oil and gas resources, whereas Canadian issuers may disclose resource volumes. Resources are different than, and should not be construed as, reserves. For a description of the definition of, and the risks and uncertainties surrounding the disclosure of, resources, see above. This news release contains certain forward-looking information and statements within the meaning of applicable securities laws. The use of any of the words “expect”, “anticipate”, “continue”, “estimate”, “objective”, “ongoing”, “may”, “will”, “project”, “should”, “believe”, “plans”, “intends”, “strategy” and similar expressions are intended to identify forward-looking information or statements. In particular, but without limiting the foregoing, this news release contains forward-looking information and statements pertaining to the following: the recognition of significant additional reserves under the heading “2013 Independent Reserve Evaluation” and the recognition of significant resources under the heading “NE B.C. Montney Resources Evaluation”, the volumes and estimated value of ARC’s oil and gas reserves; the life of ARC’s reserves; the volume and product mix of ARC’s oil and gas production; future oil and natural gas prices; future results from operations and operating metrics; and future development, exploration, acquisition and development activities (including drilling plans) and related production expectations. The forward-looking information and statements contained in this news release reflect several material factors and expectations and assumptions of ARC including, without limitation: that ARC will continue to conduct its operations in a manner consistent with past operations; results from drilling and development activities consistent with past results; the continued and timely development of infrastructure in areas of new production; the general continuance of current industry conditions; the continuance of existing (and in certain circumstances, the implementation of proposed) tax, royalty and regulatory regimes; the accuracy of the estimates of ARC’s reserve and resource volumes; certain commodity price and other cost assumptions; and the continued availability of adequate debt and equity financing and cash flow to fund its plans expenditures. There are a number of assumptions associated with the development of the Evaluated Areas, including the quality of the Montney reservoir, continued performance from existing wells, future drilling programs and performance from new wells, the growth of infrastructure, well density per section, and recovery factors and development necessarily involves known and unknown risks and uncertainties, including those risks identified in this press release. ARC believes the material factors, expectations and assumptions reflected in the forward-looking information and statements are reasonable but no assurance can be given that these factors, expectations and assumptions will prove to be correct. The forward-looking information and statements included in this news release are not guarantees of future performance and should not be unduly relied upon. Such information and statements involve known and unknown risks, uncertainties and other factors that may cause actual results or events to differ materially from those anticipated in such forward-looking information or statements including, without limitation: changes in commodity prices; the early stage of development of some areas in the Evaluated Areas; the potential for variation in the quality of the Montney formation, changes in the demand for or supply of ARC’s products; unanticipated operating results or production declines; unanticipated results from ARC’s exploration and development activities; changes in tax or environmental laws, royalty rates or other regulatory matters; changes in development plans of ARC or by third party operators of ARC’s properties, increased debt levels or debt service requirements; inaccurate estimation of ARC’s oil and gas reserve and resource volumes; limited, unfavorable or a lack of access to capital markets; increased costs; a lack of adequate insurance coverage; the impact of competitors; and certain other risks detailed from time to time in ARC’s public disclosure documents (including, without limitation, those risks identified in this news release and in ARC’s Annual Information Form). The forward-looking information and statements contained in this news release speak only as of the date of this news release, and none of ARC or its subsidiaries assumes any obligation to publicly update or revise them to reflect new events or circumstances, except as may be required pursuant to applicable laws. ARC Resources Ltd. (“ARC”) is one of Canada’s largest conventional oil and gas companies with an enterprise value of approximately $10 billion. ARC expects 2014 oil and gas production to average 110,000 to 114,000 barrels of oil equivalent per day from its properties in western Canada. ARC’s Common Shares trade on the TSX under the symbol ARX.